Considering the amount of time most homeowners spend inside their homes, it’s not surprising to learn that most remodeling dollars end up indoors. However, neglecting the outside of your home can leave it looking rundown. Even if you are not close to considering putting your home on the market, it never hurts to improve the overall look of your property. 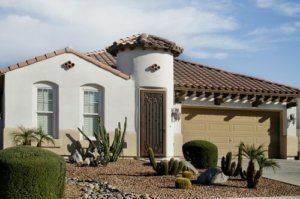 Here are a few projects that can help boost your home’s curb appeal and guarantee that the exterior of your home looks as great as the inside. Let’s face it: missing shingles and sagging, unreliable gutters do more than make your home look worn; they can actually cause expensive problems. If you notice that your gutters are having trouble moving water away from your home’s foundation, or if you can’t remember the last time you had your roof inspected, it’s probably a good idea to have a professional inspect the situation. If you’re ready to spruce up your home’s landscaping, plan to do it when the weather is relatively cool. When planning your projects, always consider the grade surrounding your home. Over time, it can become compacted and slope toward your house. And poor grading can cause water to flow toward your home, placing your home’s foundation at great risk for damage. If unattended to, siding can start to mold, rot or, even worse, warp. With a bit of preventative maintenance, you can avoid potentially expensive siding repairs. For example, according to industry experts, pressure washing the exterior of your home once a year can remove dirt and prevent mildew and mold. Also, if you see chipping or peeling paint, it is probably time to break out the sandpaper, paint and paintbrushes. Most of the time, thid is a project that you can complete in a day. However, the project might involve more work than you have time for. If this is the case, it’s probably time to enlist the help of a professional. Republic West Remodeling offers remodeling contractors in Scottsdale that can help you boost your home’s curb appeal. Contact us today for details.